One of those is a garden trowel. The foundation of the gardener’s toolbox, this tool is the one to rely on in many situations. How to find the best garden trowel for your particular needs? 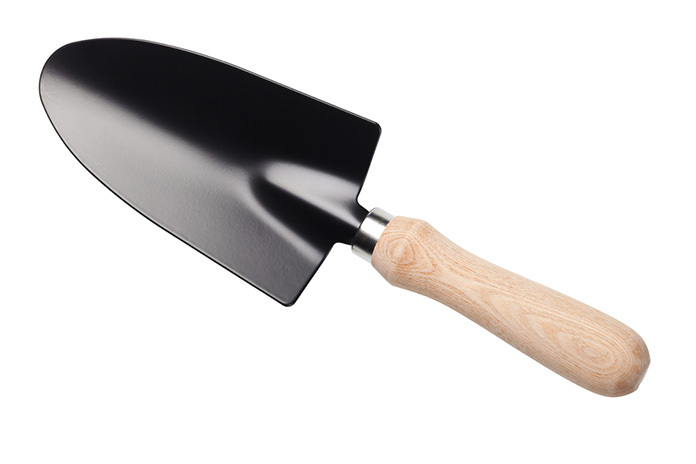 ​What to look for in a garden trowel? 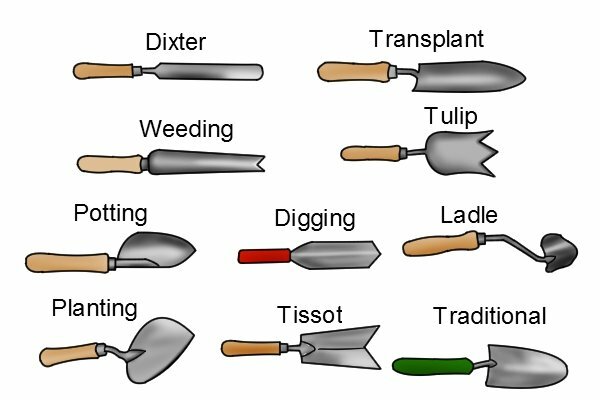 ​What are the different types of garden trowel handle? 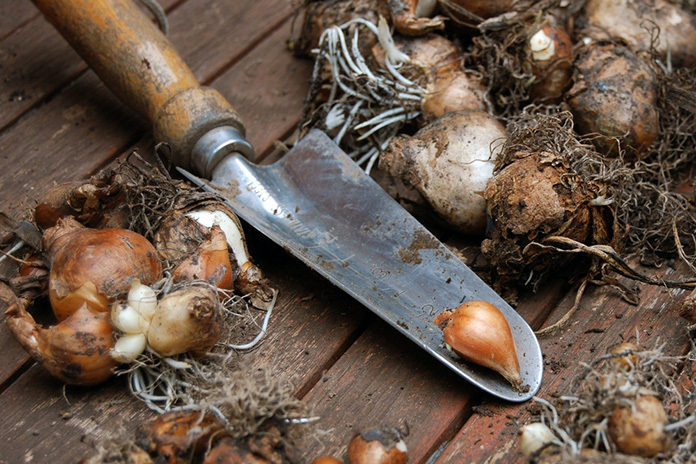 ​The Trowel is such a versatile tool that there are many ways to use it in a garden. Depending on its type, we can use it to move a plant from one location to the other, like taking out a seedling from a greenhouse. 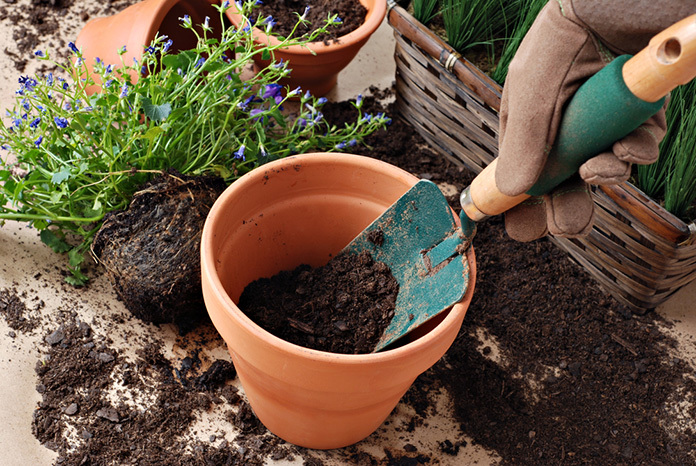 ​Another option is to use it to fill the pots with soil to prepare them for planting by mixing fertilizers in for best growth and health of herbs. ​Some trowels even have sharp edges fit for cutting weeds, so there is no damage to the nearby flowers or for clearing up a piece of land to prepare it for planting. Grip – If you plan on using a trowel more often, or if you have a health problem with your hands, it is best to consider looking for an easy grip handle to reduce the stress on your wrist while you are using it. Leverage – Another thing to pay attention to with certain types of handles is that you can reduce joint stress by picking a garden trowel that gives you more leverage for easier digging. 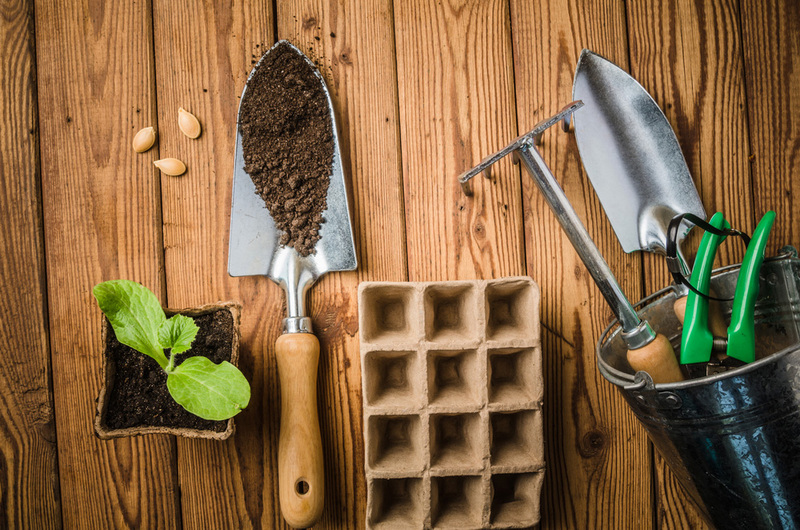 Weight – If your garden requires you to work with a trowel for a long time, weight becomes an important matter if you want to keep your wrists healthy and under less stress, so try to pay attention to the weight of your chosen tool as well. Curved Blade – You need to consider the type of work you plan on doing with your trowel because, for everyday garden work, a curved blade is a practical feature to have in one and will make your gardening work easier. 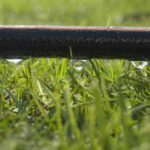 Blade Width – Depending on the type of plants you have in your garden, and for what purpose will you use your trowel, you might need a wider or narrower blade to work with, so that is another thing to keep in mind. Standard garden trowel handle: This kind of handle is the most common one and the most used one for a trowel. It has a slightly curved shape, so it provides easy grip and handling, and it can be made out of wood, plastic or rubber. Long garden trowel handle: As the name says, the long handle is at least 6.3 inches (16cm) long, and it is most used for parts that are hard to reach, as well as for weeding or for planting seedlings that have longer roots. At the end of the handle, there is a bulb that prevents your hands from slipping while working. P-grip garden trowel: This 7-inch (18cm) handle has a T-section at the end which makes it very comfortable to use if you have a carpal tunnel syndrome or you have arthritis in your wrists because it provides extra leverage while you use it for digging or planting. Ergonomic garden trowel handle: An ergonomic handle has a radius grip, a curved handle, that fits perfectly in the palm of your hand, so there is no strain on the wrist while working for longer periods of time. Plastic: Handles made of thermoplastic polymer are affordable, waterproof, light, have a soft grip and because of bright colors, they are easy to spot while we work in the garden. However, they are not durable, and plastic handles don't fit all trowel blade types. Rubber: The synthetic rubber is used to create ergonomic handles that are waterproof, light, don’t cost much and are easy to handle. Like with plastic handles, rubber also doesn't fit all trowel blade types. Wood: ​It’s the most commonly used material because it is durable, easy to repair, and it fits all types of trowel blades. The downside is that it can splinter and it’s a bit more expensive than other two materials. Traditional garden trowel blade: This is the most versatile type in size, weight, and width and as such, it is best used for digging and breaking the ground preparing it for planting. 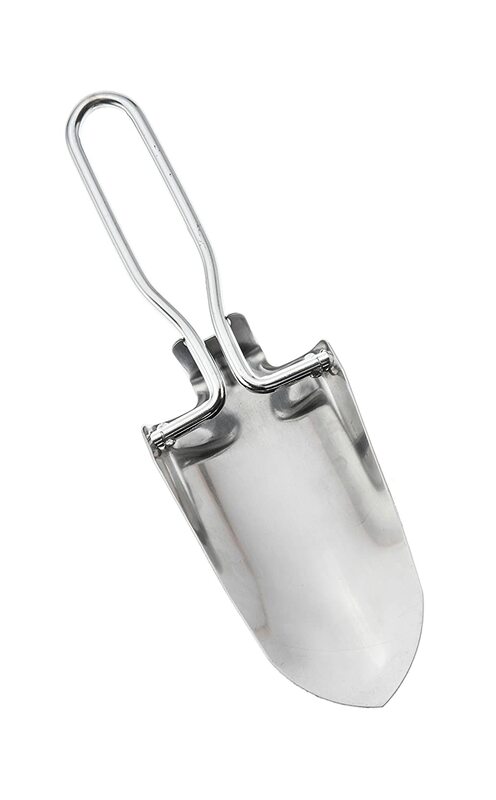 Transplanting garden trowel blade: This trowel is similar to the traditional one, but with a narrower blade, this type is used to transport seedlings from one location to the other. 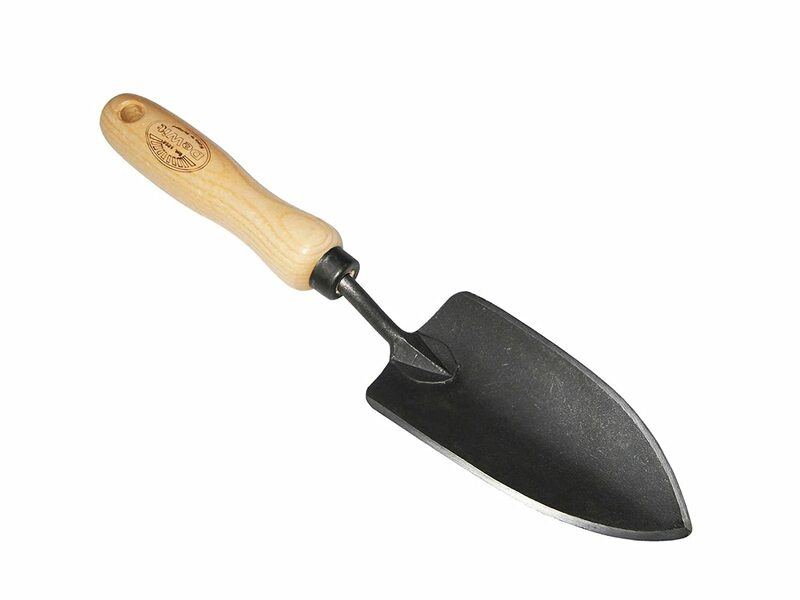 Dixter garden trowel blade: It is used for digging deep holes around the deep root weeds in a more rockery garden. The long thin blade is so firm you can hit it with a hammer to go deeper into the rocky soil. You can also use the Dixter to sow seeds easier and have them be in a straight line. Potting garden trowel blade: Best used for placing soil in the pots, this blade is wider and shorter, and it can be made for left/right-handed people with one edge more curved for easier scooping. 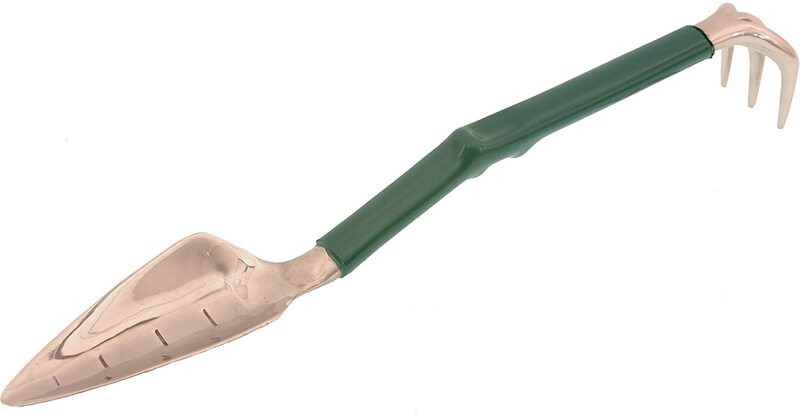 Ladle garden trowel blade: This trowel has a very long tang and a small rounded blade with curved edges that looks like a ladle, and it's used to make round holes in the earth for planting. 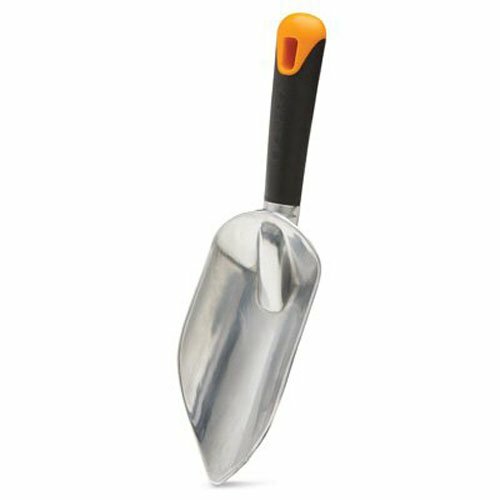 Tulip garden trowel blade: The blade has three sharpened tips on the end in a shape of a tulip which makes it a perfect tool for cutting into the soil through roots to make more room for new plants to spread. Digging garden trowel blade: This one has a thin blade with a pointed end in the shape of a dagger, and it's slightly heavier with a better leverage than the other types. It is used for digging holes or cutting. Planting garden trowel blade: Its blade is a smaller heart-shaped, flat one with a pointed tip used for planting in small and tight spaces. It's also firm enough so you can use it for picking out stones from the soil. 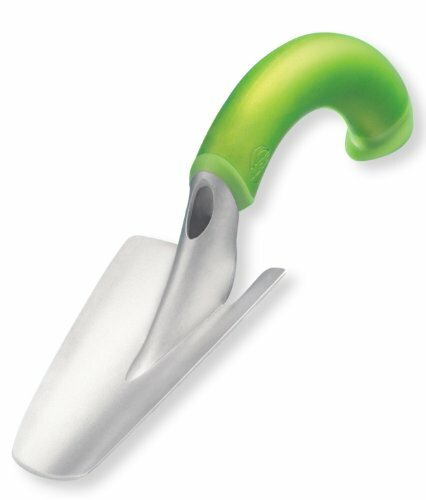 Weeding garden trowel blade: The blade is long with a forked end perfect for weeding plants with long roots. There are two varieties, a standard one, and a heavy duty one. Standard is narrower and used for general weeding while the heavy duty one has a serrated cutting edge used to cut thicker roots. ​Besides several types of garden trowel blades, you should know that these blades can be made from different materials, and the one type of blade can have a plastic, aluminum, and copper version. As a gardener, you’ll have to know which one might suit your needs perfectly. ​So, when you browse through the available garden trowel models, you should pay attention to the blade material as well, since it can be a detrimental factor in the purchasing decision. ​Considering the characteristics we stated and compared for you, your decision process should get you through all the questions and necessary features. There is a trowel that will suit your needs the best, you only need to select the proper model. With the proper decision, you’ll be able to do all the work in your garden using it. This product's main feature is its size. It's made for someone with big hands and strong grip. The blade is extra-large with sharp and curved edges, and it's made of cast-aluminum, which means that there will be no rust on it even if you use it in moist earth. It is also strong enough so you can use it for digging, weeding, transplanting or loosening the soil as a preparation for planting even if the ground is a harder one. The handle is also extra-large with a soft rubber coating that reduces the strain on your wrist if you work for a longer period but also provides excellent control in handling. At the end of the handle, there is a hole, practical for hanging the trowel once your work is done. Its weakest point, however, is the place where the handle connects to the blade. The core of the handle is plastic, so it's prone to breaking at this spot. There is a lifetime guarantee though in case that happens. This stainless-steel trowel is made for smaller hands. Its main feature is that it’s foldable, which makes it very practical for carrying around when doing work in the garden or going on a camping trip, and the fact that it comes with a special nylon-canvas carrying case proves that. Having a stainless-steel blade means it is rust resistant, and with curved and sharp edges it’s good for planting, weeding or digging, but the soil needs to be softer. This trowel is not suitable for rocky terrain. Even though the blade is a stainless-steel one, the handle is just chrome-coated steel, and it is not rust resistant. It is also small, and it's slightly tricky to use. There are two negative features considering the handle. One is that it puts some extra strain when used for a longer time. The other is that it is prone to folding if used on a harder soil due to the locking mechanism that can get loose. So, if that happens, the handle might need slight adjustment and wearing gloves while using this trowel is advisable. The first thing you notice about this trowel is that there are no parts. This is a one-piece design made of hand-forged, tempered boron steel and because of that, there are no parts to get loose or bend at the neck. The hardwood handle is mounted on the steel itself very firmly, so you won’t have worry about its firmness. Being made from this durable and tough steel, the tool is versatile and hard enough to go through any type of soil without problems. Because of its sharpness it’s best used for heavy weeding, transplanting and digging. This trowel is smaller version of the highly popular standard forged trowel from DeWit, which was a big hit among gardeners. It delivers the same quality with smaller dimensions and better versatility. Handy to note is that the trowel comes with several handle and size options for you to choose, with each containing the same qualities and features while providing you with different ergonomics and blade size. The small one’s dimensions are 11.8 x 1 x 2.6 inches and it’s quite lightweight which means it won't put much strain on the wrists even when you use it to scoop larger amount of soil. But if you use it for this, expect some blisters. This very well made trowel has an ergonomic handle, specially made for people who have health issues with their hands and wrists, so it barely puts strain while working. The curved handle features a Santoprene thermoplastic handle that is also latex-free for those who are allergic to it. And no matter if it’s wet or dry, the control you have in your grip will always be comfortable. The blade is made of ultra-light aluminum/magnesium mix and is very sturdy and rust resistant. The edges are not very sharp, so it's ok to use it for softening the soil, but the shape of the blade also makes it easy to use for planting or transplanting. And the blade wings are useful for pulling roots out and weeding. The blade also clogs up a little if the soil is wet, so just slide it down with your hand. Don't hit a rock or something hard to shake the ground off because it can break. In case that happens, there is a lifetime warranty. This garden tool is an interesting merge of a trowel and a rake called Trake. It combines the features both of these tools have and gives us a highly functional, versatile and useful multi-purpose tool you can use for digging, weeding, planting, raking, and because of its length, you can use it kneeling or even sitting. The handle has a non-slip vinyl coating that provides excellent leverage, and a comfort thumb rest and an ergonomic handle design work in both directions providing reliable grip control and don’t strain the wrist while using it. Both the trowel blade and the rake are made of a durable die-cast alloy that won't bend and is rust resistant. The blade is made to easily penetrate the soil, just be careful not to use it on too hard or rocky terrain because the tip is prone to breaking. The rake is narrow enough, so you will have no problem moving it between other plants. The warranty/return period is only two months though even with the price being slightly higher. ​Tending to a garden requires more than just a single tool to work with, so there is no clear winner to pick from this list of products. “Gardening is about enjoying the smell of things growing in the soil, getting dirty without feeling guilty, and generally taking the time to soak up a little peace and serenity” ~ Lindley Karstens. So, each of these will do its role in making our gardens flourish. It is only a matter of which one suits you the most. For the overall winner on today’s roundup, Fiskars Big Grip Trowel ﻿(#1) brings the most value and can be the foundation of your gardening toolbox.